Was this the first Christmas miracle of 2017? 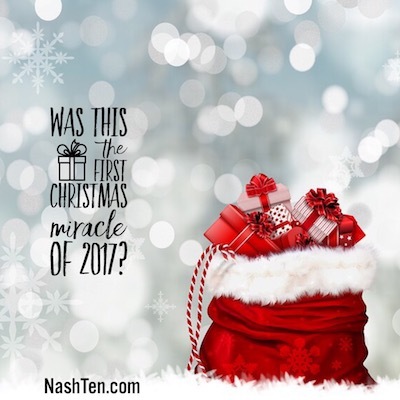 The last time we spoke, I told you about the crazy and “miraculous” things that happen in real estate this time of year. And I’ve had my first one for the season. I had a client [and friend] call at the beginning of December thinking about selling one of her investment properties. So we listed in on December 7th with a mad advertising plan. Had it under contract on December 11th. Buyer performed the inspection and accepted it as-is on Dec 15th. The buyer had remorse and canceled the contract on Dec 15th. We re-listed the property on Dec 15th. I went into action contacting every potential buyer for miles around. Had it back under contract with another buyer on Dec 18th. Closed and in the books on Dec 20th. In 13 days it was listed twice, under contract twice and closed at list price. A new record for me and a happy client at year end. Most people think this is the wrong time of year to do business. And could they be more wrong? If this sounds good to you, then you still have some time to act before the competition is no longer distracted by the holidays and snow. Because when the weather warms up in February or March, the hordes of future homeowners are back on the prowl messing up your ability to get the best deal possible on your next home. And if the economy takes off with the new tax plan, expect the interest rates to follow. Don’t hesitate to give me a call so we can get a head start on the competition and the best deal possible for you. I’ll be looking forward to your call. The Daily Deal in Nashville is this 3 bedroom ranch home in Shelby Village [East Nashville] that needs updating and is listed for less than $200,000. P.S. This will be my last letter until the new year. While I’m away, I promise to dig deep into the new tax bill and see how this will affect you. Don’t believe what you read in the news because most of those writers will never read the bill and don't understand the local real estate market. I’ll be sharing what I find in my first letter of 2018.